Runners and walkers of all ages will exercise, toss around colored chalk and raise funds for charity at Sunday’s Pattaya Color Run at Big Buddha Hill. About 500 men, women, boys and girls are expected to join in the event organized by the Rotary Club of Jomtien-Pattaya. It is sponsored by the Pattaya Sports Club, Norwegian Properties Group, Pattaya Mail Media Group, Pattaya International Ladies Club, Jotun Paints, TBX, Pattaya Self Storage, Lactasoy, Sponsor electrolyte drinks, Mama noodles, and A&A Control Co.
Club President Vutikorn Kamolchote said Jan. 7 the walk-run is open to all ages and sexes, with two routes for both running or walking. 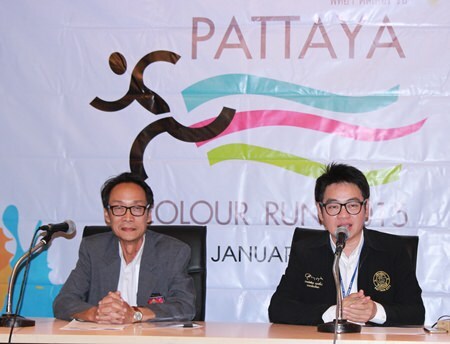 Rotary Club of Jomtien-Pattaya President Vutikorn Kamolchote (left) and Pattaya City Council member Rattanachai Suthidechanai (right) announce the much-anticipated Pattaya Color Run will take place on Big Buddha Hill this Sunday. The event will include a two-kilometer walk and five-kilometer run starting at 8 a.m. at the Big Buddha Hill Park. Entry tickets for the walk are 200 baht and 400 baht for the run. They can be purchased Saturday at the Pratamnak Hill area from 1-5 p.m. Planned activities include a “color powder shower,” live music and stage shows, award presentations, and souvenir sales. Colored powder will be splashed at two points; yellow will be splashed by Big Buddha Hill and pink just before the finish line. Organizers said yellow and pink are bright colors that make unusual combinations designed to the draw attention of tourists. Participants also will receive colorful t-shirts made especially for the event. Local authorities will supply first aid, ambulances and directional signs. The day will also feature booths selling products, photography and assistance to the many expected to attend. Vutikorn said the Color Run money raised from the event will support community, family activities, tourism promotion, and the charity works of the Rotary Club of Jomtien-Pattaya, especially those for students, children, the disabled, and underprivileged.